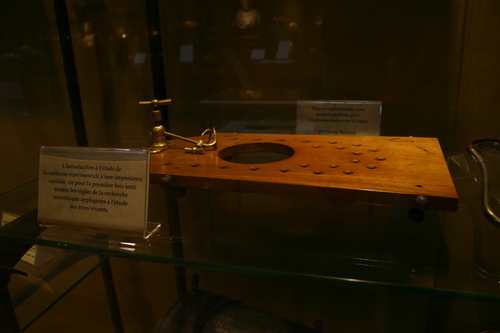 This wooden and brass platform was used by Claude Bernard in his physiological experiments with rabbits. It can be seen in a showcase in the Musée d'Histoire de la Médecine of the Université Paris Descartes, Paris. As it is well known, Bernard was involved in early disputes about vivisection that came to damage also his private life1. 1. Luca Borghi, Umori. Il fattore umano nella storia delle discipline biomediche, SEU, Roma 2012, pp. 120 ss.